We’re expecting a new shipment from Vanilla very soon. We’ll be getting several new skates from them. There will be two new designs for the Vanilla Junior package. The Junior Royalty has a deep dark shade of red boot, with a gold tongue. The Junior Mint is a light mint green shade. 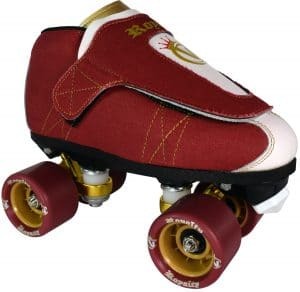 Both of these come in sizes 3-12 and are the same price as the other Vanilla Junior skates. 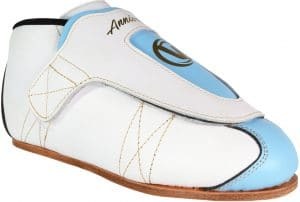 They’re also doing an Anniversary version of their Freestyle boot in a light blue color. 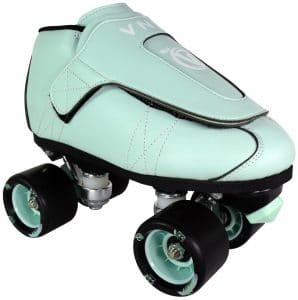 If you remember back to when Vanilla first started, this was the color scheme they used on their very first batch of boots. This one comes in sizes 6-13 and is the same price as the other Vanilla Freestyle boots. Each of these are on a shipment from Vanilla that should be here by October 17. Each of these are being called limited editions, so get them quick if you’re interested. We’re also now carrying a couple of new skate maintenance items. Gear Bombs are small balls that you insert into your skates. You pull the “bomb” apart, and it releases an odor fighting mist right into the boots. They come in pairs, one for each foot. Shoe Goo is a material that helps protect shoes from damage and wear. It comes in a 3.7 ounce tube.